Many have found their calling at Baylor -- callings that resonate for a lifetime. Four consecutive generations of the Ellis family have heard God's call, both to Baylor and to be a minister in some way. Their journeys haven't been identical, but what Neal, Perry, Johnson and Landen Ellis do share is a passionate pursuit of God's call -- combining for nearly a century of ministry and evangelism in both the U.S. and Brazil -- and the faithful humility to never see their accomplishments as their own. Neal Ellis, '22, began his college career as a benchwarmer on the Baylor Bears' football team. His mother used to tell her friends, "Neal plays left end in practice and left out in the game." But when the first-string player stopped showing up to practice, Ellis made the most of the opportunity, and his effort and determination paid off with Neal playing left end on the team that would win the Southwest Conference Championship in 1922. Neal applied that same effort and determination to life off the field at Baylor. Working in a small bakery in Waco to pay for school while living on the back porch of a boarding house, he would sometimes wake up to a blanket frosted with snow. According to family history, Neal is heralded as a Waco celebrity and hero. In 1922 a massive fire engulfed Carroll Chapel and Library, which at the time housed the early collection of Browning artifacts. Neal rescued the famous "Clasped Hands of the Poets," the bronzed casting of Robert and Elizabeth Barrett Browning's hands, out of the burning collection room. Neal's time at Baylor was interrupted by a brief stint as a Navy chaplain in the Pacific, but his affection for Baylor and strong relationships at the university brought him back to Waco to finish his degree. Among such relationships were those with professors. His family can't recall exactly how the relationship began, but it was likely in an English class that Neal first met the legendary Dr. A.J. Armstrong. Neal became one of Armstrong's favorite students, and at the professor's request, worked with Baylor's registrar to organize production of one of the first Baylor handbooks, featuring a complete list of all Baylor students and their basic information. Their friendship would grow stronger over the years. Armstrong even stipulated in his will that Neal's son, Perry, should speak at his funeral. After graduating from Baylor in 1922, Neal moved one county over to serve as a missionary in Bosque County, Texas. He was ordained by the iconic Dr. E.D. Head of First Baptist Church, Waco, and later served as pastor of South Street Baptist Church in Portsmouth, Virginia, and Calvary Baptist Church in San Antonio. He also served two terms on the Southern Baptist Convention's International Mission Board. Neal was a passionate and effective preacher and evangelist, recalls his son, Perry Ellis, BA '53. "My father was the greatest personal soul-winner I ever knew," says Perry. In addition to affection for the gospel, Neal Ellis also passed on a love for Baylor to his children. Perry says he grew up green and gold, attending his first Baylor vs. Texas football game at age 6. "I was born headed for Baylor," he says. As the sons of a Baptist preacher, Perry and his older brother, Neal Jr., spent time every summer at Alto Frio Baptist Encampment in West Texas for Royal Ambassador camp. It was there that Neal Jr. committed his life to becoming a medical missionary in Africa, and a similar seed was planted in Perry. That seed was nurtured during a Youth for Christ meeting in San Antonio, led by Billy Graham, when 14-year-old Perry first felt the call to preach. Perry would begin his journey to the ministry by pursuing his education as his father and older brother had, at Baylor. He committed his life to mission work during a campus revival, and when his brother, Neal Jr., died from cancer at just 22, before ever making it to the mission field, Perry "felt a strong leading to take up where he left off." While at college, Perry joined the "Baylor Youth Revival Team," a group that led dozens of student-focused crusades across the U.S. He was also the designated evangelist and soloist for the Baylor Religious Hour Touring Choir. 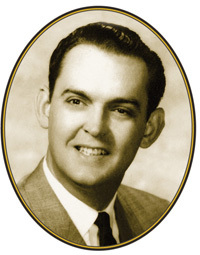 Perry studied English and was a part of Sigma Tau Delta English honor society, graduating in 1953. He continued his education at Southwestern Seminary, where he met his future wife, Roberta. "From the day I saw her, I never dated another girl," recalls Perry. At Southwestern, Roberta and Perry discovered a mutual passion for missions and began a life-long partnership in ministry. Perry went on to Oxford University to study the evangelists of the Second Great Awakening, particularly Charles Finney. Like the men he studied, Perry would return to the U.S. and become active in revivals during the 1960s, participating in stadium crusades throughout the country. In 1969, his pursuit of God's call finally led him to the mission field. 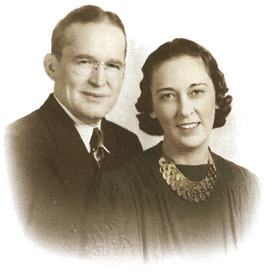 Perry moved his family (which now included two sons, Johnson and Richard, and a daughter, Autumn) to Brazil, where he served as an evangelist and director of mass evangelism for the Brazilian Baptist Convention. Although based in Sao Paulo, Perry's work led the family all over the country. Perry coordinated and led citywide crusades in most of the Brazilian states and served as the point man when the Billy Graham Crusade came to the region. Perry and Roberta -- and occasionally the entire family -- would fly into the remote villages of the Amazon region to do ministry. Roberta, a stunning beauty, and Perry, a 6-foot-9 revivalist, made a striking impression on the people they loved and served. On one occasion, a native chief proposed that he keep Roberta in his village. The Ellises politely declined. The couple would remain partners in life and ministry until 2006, when Roberta passed away after a five-year battle with Parkinson's Disease. Like Neal Ellis before them, Perry and Roberta nurtured in their family a deep understanding of the value of evangelistic ministry and a desire to serve others. Although Johnson Ellis, BBA '84, had watched his grandparents minister and preach all across the U.S., and had grown up with his own parents serving and preaching the gospel in villages throughout Brazil, he personally never wanted to be a missionary. In fact, Johnson was so reluctant to follow his father and grandfather into ministry that he was "elated" when his brother, Richard Ellis, BA '81, "took up the mantel of ministry" and became a sixth-generation Ellis preacher. Instead, as the youngest child and the last to make his way to the U.S. for school, Johnson headed to Baylor (at age 16) on a very different path: as a triple major in economics, real estate and finance. Reminiscent of grandfather Neal's experience, and coming from a missionary family, Johnson was short on funds to pay for tuition. He quickly found himself working three jobs to pay for his studies. One day, burned out from an overload of work and school, he observed several vending machines being removed from campus. He proposed to the director of the business administration program that the empty spots be filled with video arcade games. Within a few months, the games had paid for themselves in coinage, and an entrepreneurial passion was born. Johnson further added to his tuition-funding enterprise by developing relationships with Blue Bell ice cream and Dr Pepper, then fashioning homemade concession stands to sell snacks at Floyd Casey Stadium, and even hiring and managing a staff to bring refreshments to game patrons. Despite his many tales of business ingenuity, the college story Johnson is most eager to share is how he met his wife, Beth Bolton Ellis, BA '85, during his junior year. On a blind date set up by friends, Johnson and Beth began the usual first-date information exchange. They quickly discovered they had both spent time growing up in Arkansas, so Johnson asked Beth what city she was from. Having spent time in Little Rock with his family on furlough, Johnson's interest was naturally peaked. As the geography began to narrow, the pair further discovered that they had not just grown up in the same city and neighborhood, but on the same street. When all seemed too serendipitous, they discovered they shared the same childhood address. But how could this be? Beth told Johnson how her father, Jim Bolton, BA '52, a successful businessman, had heard God tell him to give his house to the church. Faithfully, he bequeathed the property to their church, which in turn used the property to house missionary families. "Beth's father, my future father-in-law, provided me a home as a child," Johnson reflects with awe. "Without even knowing it, he had given me a home." Johnson and Beth married in 1986. Johnson continued his entrepreneurial pursuits after graduation, first by landing a corporate job right out of college. But a short while later, tired of the grind, he left to pursue a business opportunity with a friend-turned-partner. They founded Cura Emergency Services, a company that specializes in cleaning hazardous chemical spills. Today, as one of the largest hazardous material cleanup companies in North America, the company cleans more than 1,000 spills a year in the U.S. and Central America. Even in the midst of his success, Johnson continued to pray, "God, don't let this be the whole story of my life." And it wasn't. Though his feet were planted firmly in the business world, his heart had never left Brazil. Thanks in large part to his business success, Johnson has been able to return to Brazil in a way he never imagined. 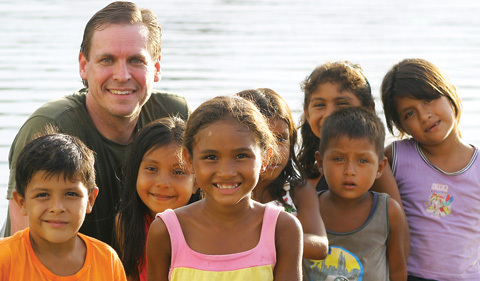 In 1999, he and a small group of individuals with a passion for the Amazon River Basin founded Amazon Outreach, a non-profit mission organization that sends hundreds of people to Brazil every year to provide free medical and dental care, eyeglasses, clothing, wells for clean water and to share the gospel among the nearly 33,000 villages along the river that have never heard the good news. The ministry primarily operates around a fleet of three large riverboats: Linda Esperanca (Beautiful Hope), Amor e Esperanca (Love and Hope) and Aguas de Amor (Waters of Love). Amazon Outreach partners with individuals, churches and organizations in Brazil and throughout the U.S. to meet the physical and spiritual needs of the Brazilian people. Now living in Dallas, Johnson and Beth have three children: Landen (21), Sheridan (17) and Graham (16). Not surprisingly, all three have made their way to Brazil; Landen, the oldest, has made her way to Baylor as well. Growing up, Landen Ellis knew nearly her entire family had donned the green and gold, but when she chose Baylor, it wasn't simply by default. "I didn't actually want to go to Baylor because of the history in my family," says Landen. "I was going to stand out. But then I saw Sing." 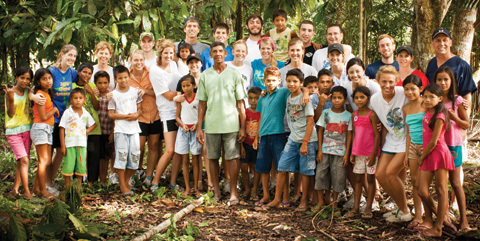 Landen Ellis (left and above in pink bandana) followed in her family's footsteps on mission trips to the Amazon and by coming to Baylor. 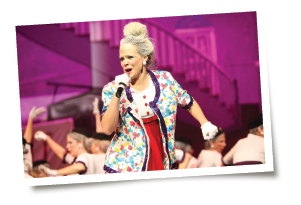 She led her Pi Beta Phi sisters in a Sing-winning performance last spring and some of those same Baylor classmates on a mission trip during the summer. The spectacle -- its bright lights, punchy costumes and fierce competition -- left Landen love-struck. This past spring, she and her fellow Sing chairs led Pi Beta Phi to a first-place finish at All University Sing for the first time in the chapter's history. Now a Baylor junior, Landen has a special place in her heart for Greek life -- and not just for those competitions or because she feels she belongs. She came into the world of sororities and fraternities with a bigger goal than pledging -- she wanted to bring Greeks to Brazil. "What was happening in Brazil started resonating with me when I hit high school; I was able to comprehend more of what God was doing in the Amazon and how my family was able to be the hands of Jesus. I wanted to get as many people involved as possible," she explains. This summer, Landen and her cousin, Harrison Ross, BA '11 (son of Johnson's sister Autumn Ross, BA '80), took the reins for the first time. The pair led a group of 16 Baylor students, all involved in Greek life, and eight other Americans to the Amazon. The six-day trip was Landen's 11th time to the Amazon in her short 20 years and represents a milestone of sorts. "I didn't quite understand the meaning behind it my first trip," she says of her initial visit, when she was just 11. "I didn't comprehend all God was doing down there." She began her visits as a youngster, working with adults in vacation Bible schools (VBS), donning biblical character costumes for skits and presenting the gospel in a simple, accessible way. Eventually, Landen was spending her summers leading the same type of VBS. As her love for the Brazilian people grew, she returned every year, essentially growing up with the kids at the churches Amazon Outreach partners with and ultimately studying Portuguese at Baylor to extend her ability to minister in this foreign land. Landen spent her formative years with one foot in the U.S. and the other in Brazil, and now she has experienced leading a team of her own and introducing that experience to others. During her group's six days in the Amazon this summer, the team did much more than just hold VBS; they discipled locals in several villages, shared the gospel one-on-one, and perhaps even helped swing an election. On their first day, diverted from their original destination because of a village-wide hangover, they instead visited a village that was holding an election. A dark-horse Christian candidate had been praying for someone to come and bring the gospel to the people in his village. Landen met with the candidate, who expressed a desire for his village to know Christ. The group of students then spent the rest of the day going door to door, sharing the gospel. The underdog won that day by two votes. On the team's last day in Brazil, three Baylor students decided to be baptized in the Amazon River. As they made their way to a cove after a game of soccer with some locals, the entire village seemed to follow them to the bank of the river. The students shared the account of John's baptism of Jesus in the Jordan River just as the sun was setting over this very different river half a world away. "I can give the shirt off my back -- I can give everything I have -- but if I leave and the people don't understand the reason why I'm there, then what's the point?" Landen echoes what has been the Ellis family theme for generations, simply joining what God is doing in what seems like remotest place on Earth. "We're not bringing Jesus to the Amazon," Landen acknowledges. "He is already there." Landen will likely return to Brazil on many more trips in the future -- like the other Ellis family Bears who have gone before her, faithfully pursuing God's call.